Íris María was born and raised in Reykjavík. She studied Psychology and Business at the University of Iceland and finished her degree in 2005 focusing on the relation between Psychology and Business in the field of Marketing. She then worked for Danslistarskóli JSB until her relocation to Denmark where she took her masters degree in Marketing at Aarhus School of Business (Aarhus University). Íris finished her M.Sc degree in 2010 and then worked for Djursland Music Academy until she moved back to Iceland in 2014 to take on the position of Marketing Director at Iceland Dance Company. 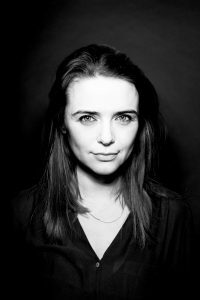 Íris has extensive experience with the Icelandic theatre scene as she has performed in various productions from the age of 14 until her relocation to Denmark.